Course contents: Basic forestry and allied courses like geology and soil science, hydrology and watershed management, soil survey and land use planning, medicinal and aromatic plants, forest entomology and pathology, apiculture and sericulture, dendrology, world forestry systems, agro-forestry and social forestry, environmental studies, forest engineering. 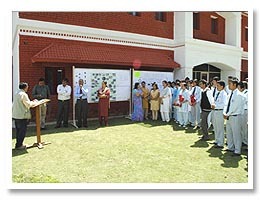 Introductory course of computer science, statistics, bio-mathematics, biology, plant physiology, biochemistry, biotechnology, genetics and plant breeding, microbiology, economics, agro-meteorology and remote sensing. Global concern about natural resource conservation and sustainable management requires trained forest managers for the management of the forests globally.